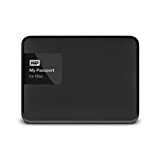 Amazon has the WD 1TB black My Passport for mac portable External hard drive - USB 3.0 - WDBJBS0010BSL-nesn for $53 with free shipping. Sells for $54+ Highest Price. Deals for $53 Lowest Price. Normally $53+.